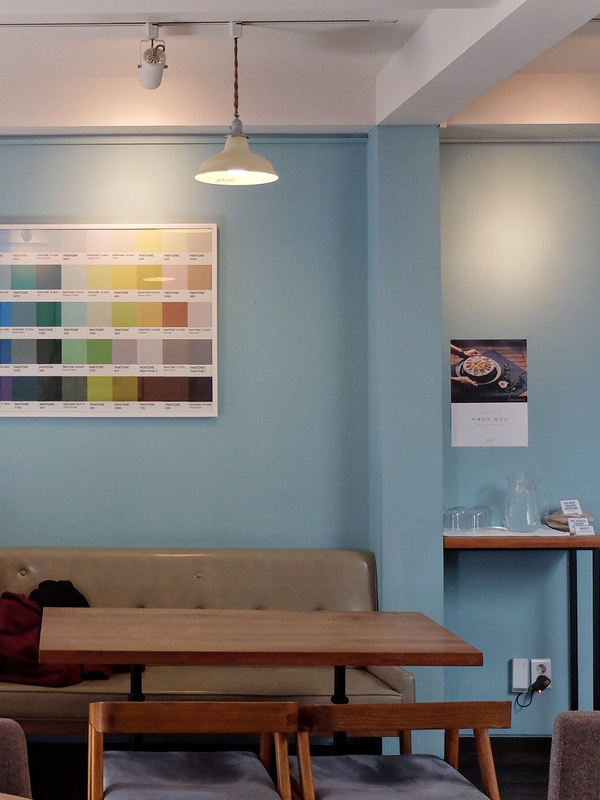 Have you ever found that perfect café where you would like to settle your headquarters? Where you feel the team spirit and interior totally match your personnality? Where you wouldn't mind sitting all day because their beverages and sweets are to good? 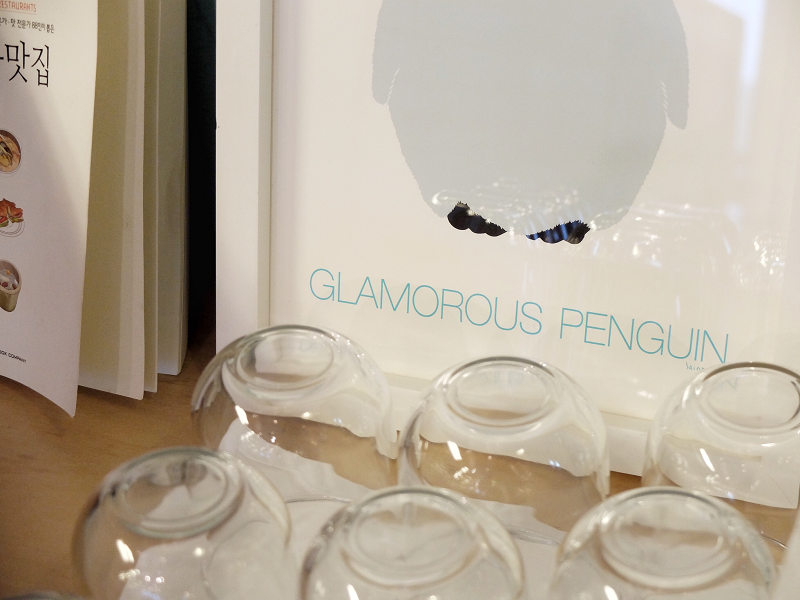 If you have, then you'll perfectly understand how I feel about Glamorous Penguin. 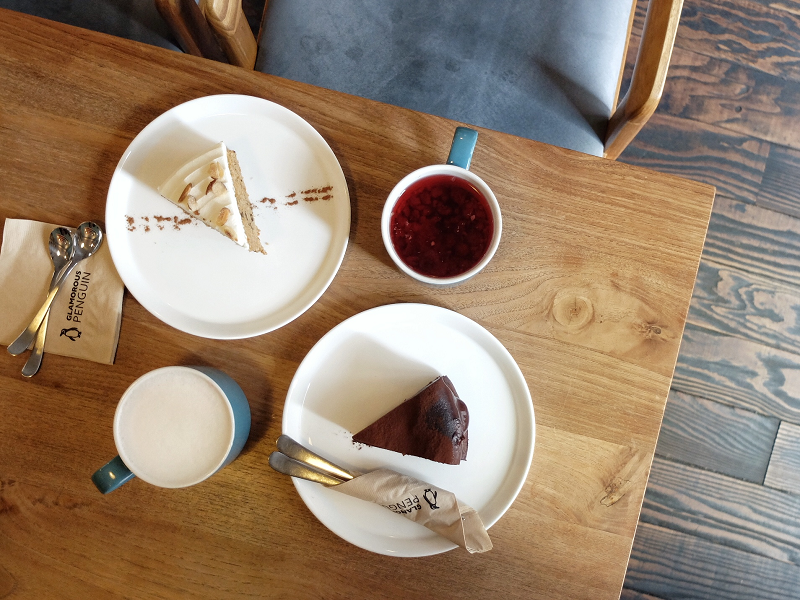 * This cosy coffee shop is located in Hannam-dong, near the Leeum museum, in a very quiet area (I'm not saying that Garosugil is full of noisy cafés but, strawberry shortcakes have a price). 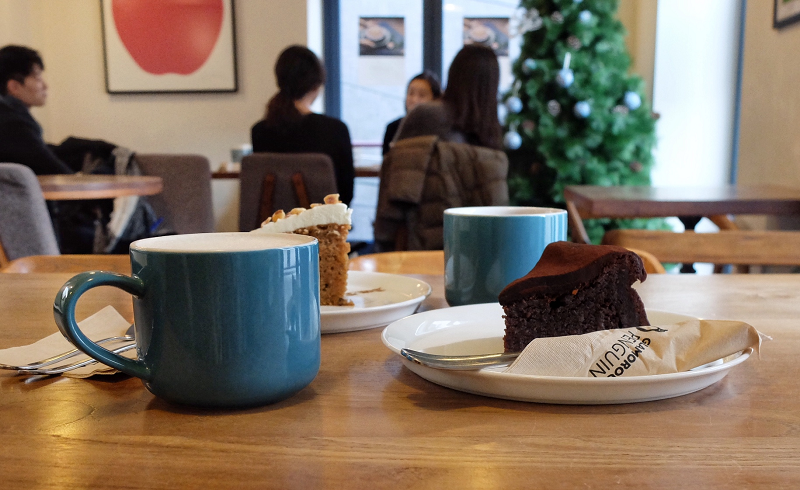 Going to this café has been on my bucket list since the first time I went to Korea and I could finally try it out last Christmas season, on a lovely, cold day. * Isn't the name such a cool and simple combination of words you secretly wish you had the idea before? Because I do. From the exit 1 of Hangangjin station, walk up the main street in the direction of Itaewon, until you bump into an italian pizza restaurant where you have to turn to your right. 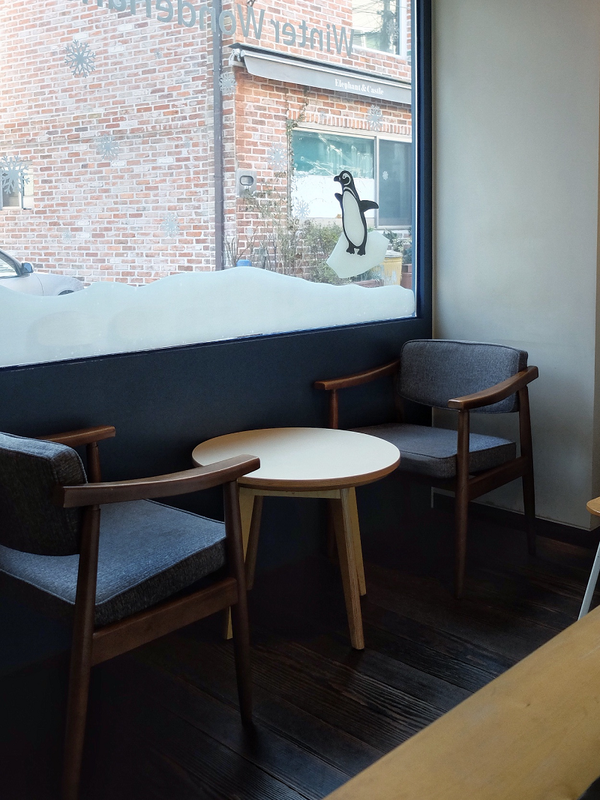 Walk into the small alleys, turn on the left, and at the next intersection you'll see that white and blue building with two adorable penguins on the wall. I love how the color are not eye-catching, which goes well with the neighbourhood discreet atmosphere and reflects the quietness inside. 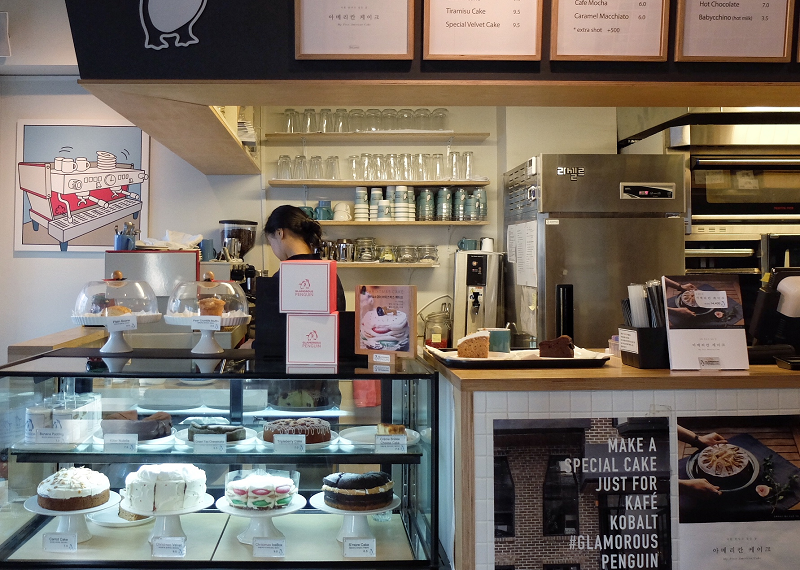 This independent café was founded by a group of lady from their common love for sweet desserts and good quality coffee, and their homemade cakes quickly became the trademark of the shop. People even call to reserve a slice, that is to say how famous and delicious it is. 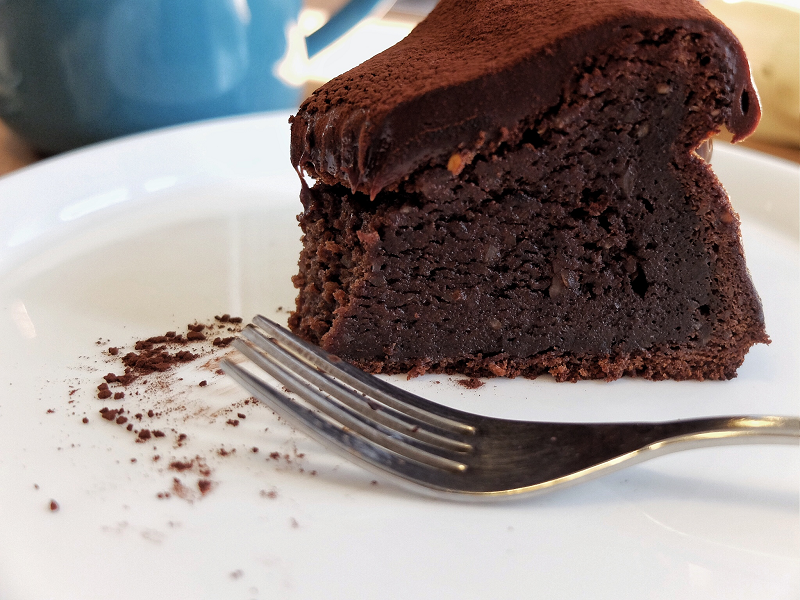 They use local, seasonal products and dairy as much as possible as they believe having good and fresh quality ingredients leads to best quality cakes. 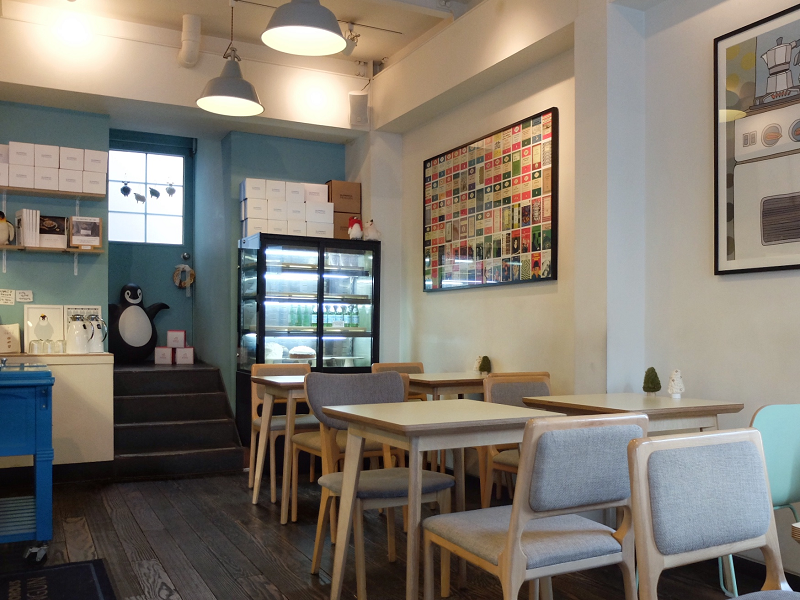 Beside the main coffee shop, the owner runs the Glamorous Penguin Bakeshop, an atelier to learn all the pastry techniques, and Humorous Kangaroo, fun baking classes for kids. 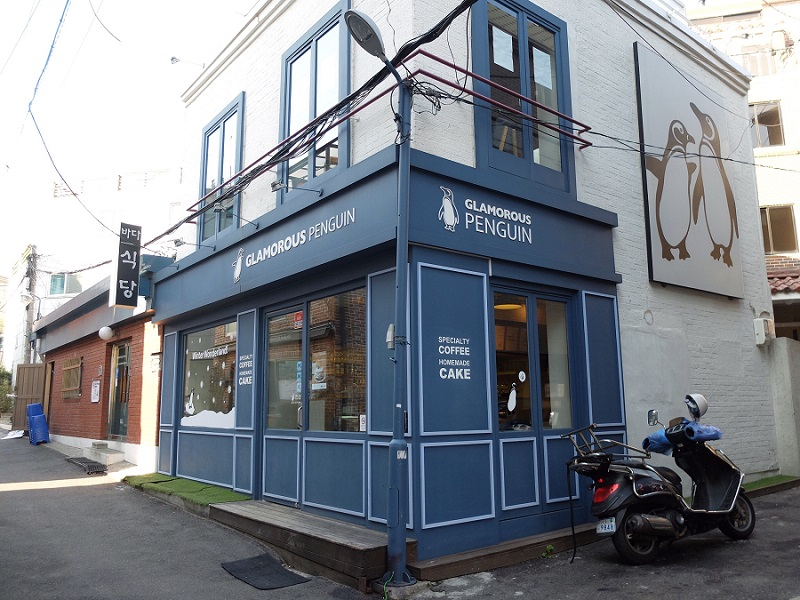 You can find more about Glamorous Penguin crew and menus on their website (available in Korean and English), or just check it to see all the lovely, mouth-watering homemade cakes pictures. 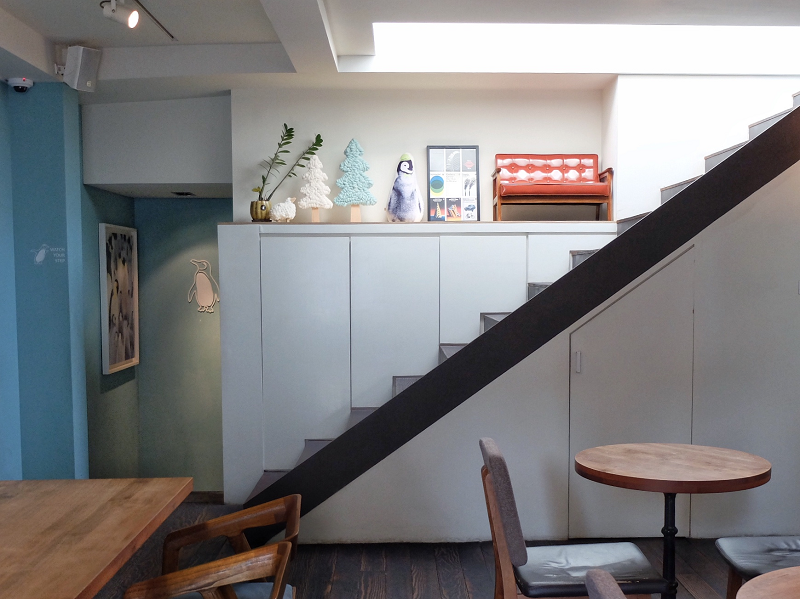 The inside also follows a mute blue and white palette with light wooden tables and greyish blue chairs, giving the place a nordic household atmosphere. 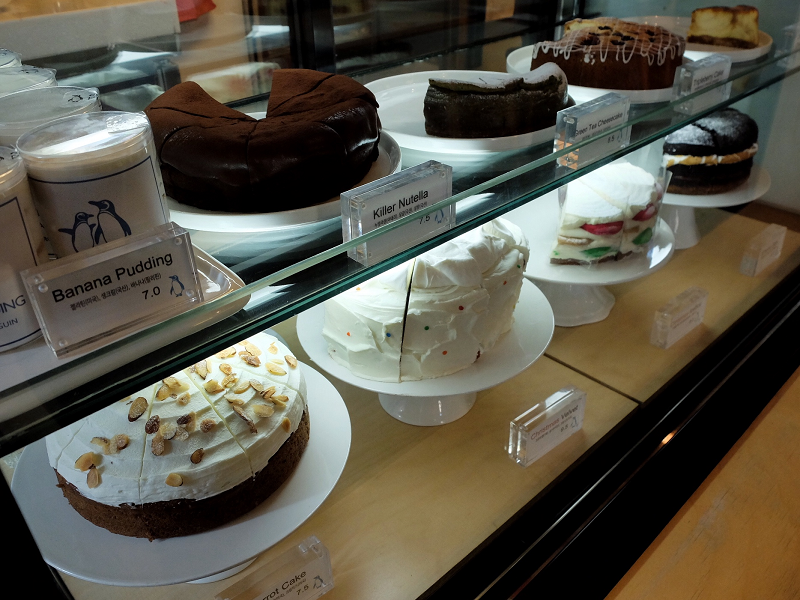 The café is very spacious, you have the counter, cake showcase and a small open-kitchen on the ground floor, with a dozen of seats and a quiet window corner. You'll find more comfortable sofas and larger tables for groups on the 1st floor, and an outdoor terrace on the rooftop is open from spring to fall. Despite the chairs have the same color tons, they have different shapes, with or without arms, lower or higher backrest, but always with a very chic touch (and super comfortable if you love firm cushions like I do). 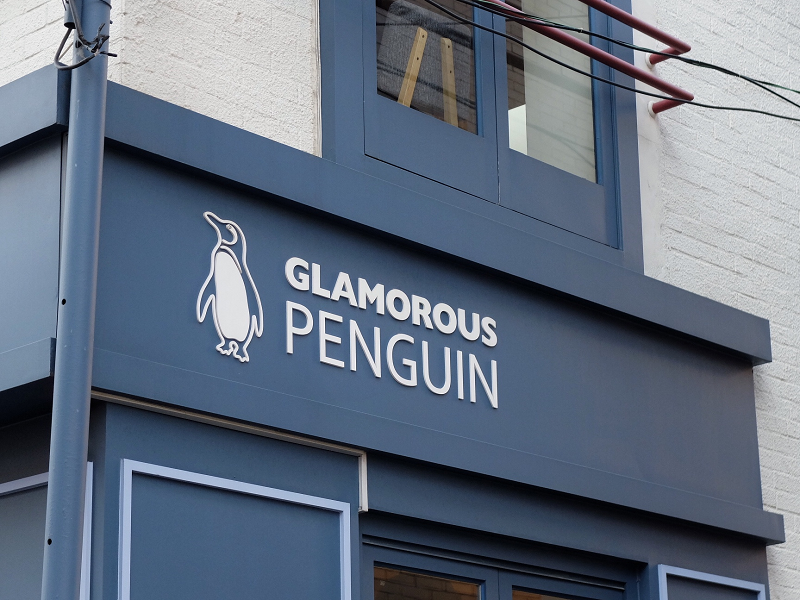 Glamorous Penguin is mainly known for their homemade, flavorful, oh-so-delicious cakes, and you cannot not have one if you go there. 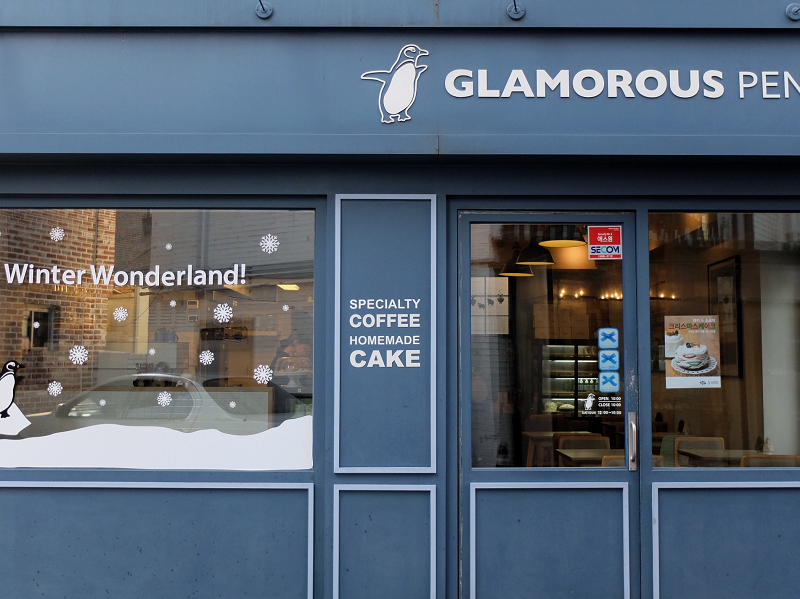 It seems like their Banana Pudding is the most famous one – with a lovely penguin glass -, but they have a large range of sweet cakes as well as savory ones (I'm curious about the cauliflower one and I wouldn't be surprised if they had some pumpkin treats this fall!). Count about 7.500 to 8.000 wons (7$) for a slice of cake, or you can also have biscuits or muffins for small cravings. For beverages, coffees are made by a certified team of baristas, and for those who are more of the non-caffeine type, they of course have herbal tea and infusions, ades made with fresh fruits, and matcha, strawberry or oreo lattes. I met my friend at 11:30am at the subway station and we were so hungry we couldn't wait to have two big slices of cake for brunch. I first went with the idea of trying their banana pudding but my eyes got caught by that melty, chocolaty top layer of the Killer Nutella and I am sorry I can't resist to these kind of things. This was for real one of the best, sweetest, meltiest fondant I have ever had. My sister made fun of me saying that but it was serisouly so delicious I almost shed tears*. I had along a cup of strawberry latte - zero artificial flavor, you could see the little strawberies swimming in the milk. 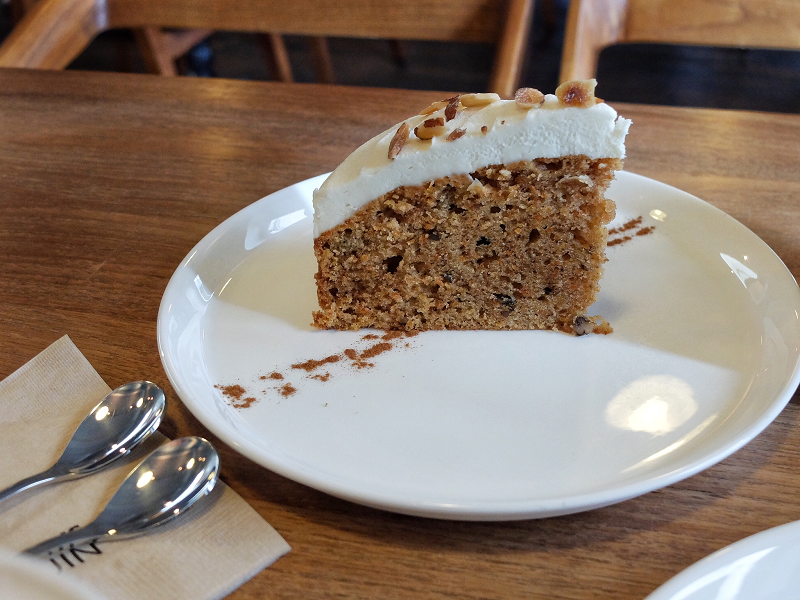 It was ok. My friend went for a slice of carrot cake and a cup of red berries tea. I had one sip and it was very tasteful (I should have gone for tea instead), with again fresh berries in. *maybe it was partly because I had been in Seoul for four months and I was craving for good european chocolate, but if you're ever in the same situation, go for their Killer Nutella! We were supposed to only stay two or three hours to work on our essays, but we ended up doing random Which Disney character are you? quiz and How to tell if a friend love you? test until dinner time. I must admit, only our belly craving for kalguksu and boiled mandu got us out of this perfect place. Time really does fly fast when you're in such a cozy, delicious coffee shop with a best friend to talk about life during hours with. 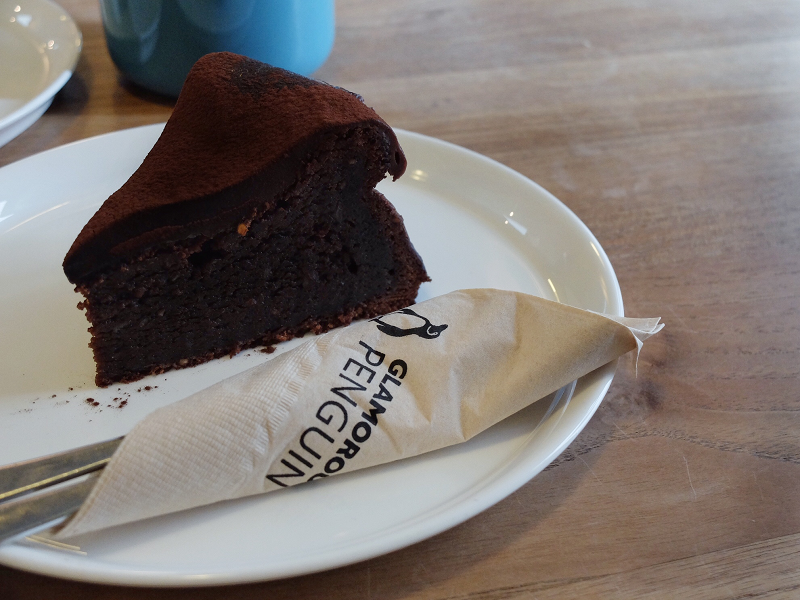 Glamorous Penguin is definitely one of my favorite coffee shop in Seoul, I just love its quietness, the lovely chairs and above all, their super delicious chocolate cake and fruit tea. 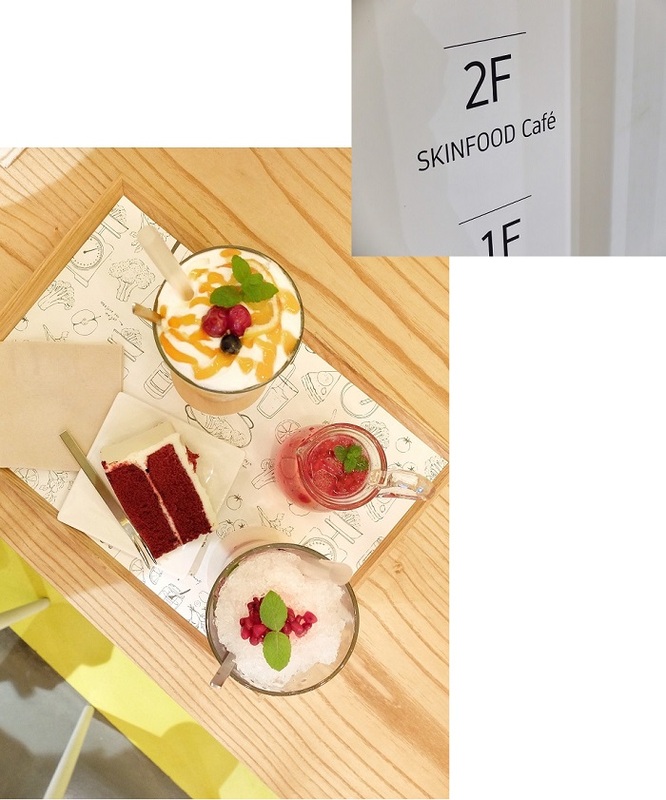 I appreciate the fact that they are an independant café which values good quality and homemade desserts over ''manufactured'' cakes, and we can feel its very own, welcoming and personal soul. this is definitely a delicious place to go for teatime!